My Peer to Peer (P2P) Experiment Update: 12 months Later | Passive Income M.D. 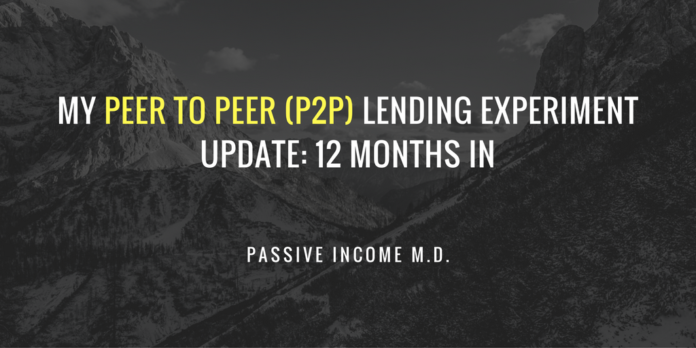 Back in July, I gave a quick update to my Peer2Peer Experiment launched at the end of October 2015. Well I’m now a little over 12 months in and wanted to give you an update. You can see the original post here, but in summary, I put $1000 into the two biggest online P2P platforms – Lending Club and Prosper. I wanted to see how both operated in terms of how to setup investing and loans and ultimately how close to their projections I would get. I’m always looking for multiple streams of passive income and I wanted to see if this might be a viable alternative. Here’s where I’m currently at. With automatic reinvesting, very little of my account sits in cash, once it accumulates to $25, it gets reinvested in another loan. I’ve invested in 55 notes, 49 of which are current and active. 4 fully paid off and completed. Both loans which were late as of my last update have been charged off meaning there’s no hope of collection. The late loans are reflected in the adjusted account value (Lending Club gets points for transparency here). I’ve invested in 30 notes, 26 of which are current and 1 of which is 1-30 days late. 2 notes have been paid in full. Prosper counts loans that are past-due (late) into total account value and into Annualized Net Returns, whereas Lending Club does not. I’m having better success with Lending Club than with Prosper, the returns are overall solid so I’m happy with them but it’s still early in the life of these loans. Most of these loans are 3 and 5 year holds so obviously quite illiquid. Investing is hands-free and automatic but at the same time feels somewhat restrictive with no control and lack of liquidity. I guess that just comes with being a lender. So far, there’s been no success with any sort of collections if the loan goes into default on either platform. I’m still a little nervous about the industry as a whole and am concerned about how these loans would do in an economic downturn. Lending Club obviously went through a huge transition with the firing of their CEO this year amidst a scandal but is still continuing to do a decent amount business. In fact, they just announced that they would be venturing into the world of auto refinance. Prosper used to allow trading of loans on a secondary market which they stopped at the end of October. The secondary market used to at least gave the investor some sense of liquidity. I’m just letting my investment ride at this point and continually reinvesting it. The whole industry seems to be undergoing a transition so I’d like to see how that shakes out into 2017 before even considering investing in it more substantially. Anybody else investing in P2P and how’s that going for you? Hello – thanks for this report. Do you have any updates? I’m considering this option but not totally sold yet. Thanks! Hi Andrea, I actually have an update coming out this month. But to cut to the chase, haven’t gotten the returns I had hoped for and I feel there are better places to invest as a lender, with less risk. The fact that P2P is not an asset-backed security makes it extremely risky in my opinion.